Image Comics and Top Cow Productions, Inc. are excited to reveal that ARTIFACTS will be serialized as a new feature on the front page of topcow.com absolutely free for fans as announced at Emerald City Comicon 2012. Beginning Tuesday, April 17th, 2012, fans will be able to go to Top Cow’s homepage and read one page per week for free. During the debut week, there will be three new pages of ARTIFACTS for fans to read. A new page will be posted every subsequent Tuesday. From Top Cow Universe architect RON MARZ (WITCHBLADE, SHINKU) and Top Cow superstar artist MICHAEL BROUSSARD (THE DARKNESS) comes the event series that shook the Top Cow Universe to its foundation. 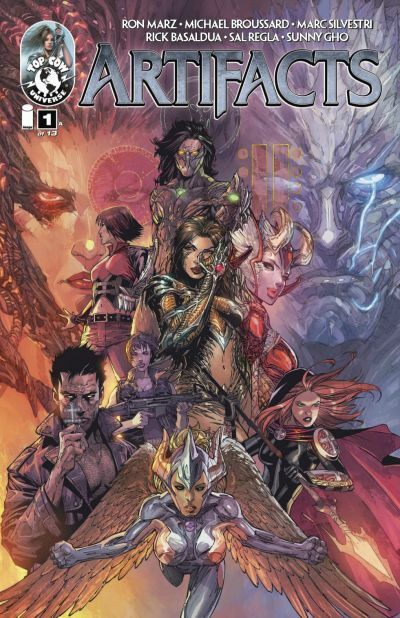 Thirteen mystical Artifacts, including the Witchblade, the Darkness and others, guide the fate of the Top Cow Universe. For centuries, it’s been whispered that bringing together all 13 Artifacts would herald mankind’s destruction. But a mysterious figure has been manipulating events, laying plans to put Armageddon into motion. The final phase begins here, with the abduction of Hope, the daughter of Sara Pezzini and Jackie Estacado. What ensues will remake the entirety of the Top Cow Universe, from the Witchblade and the Darkness, to the Angelus, Magdalena, and even Cyberforce. ARTIFACTS will debut on the front page of topcow.com on Tuesday, April 17th, 2012.